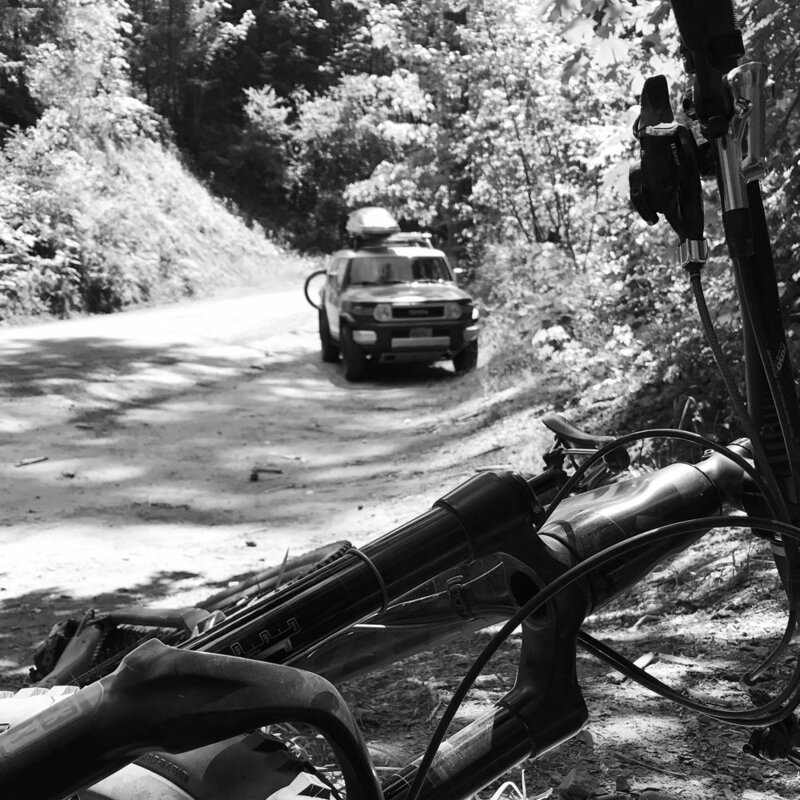 Upon arrival, it was immediate evacuation of Quoc's fully loaded FJ and hurried loading into The Ashland Mountain Adventures 16 passenger van with trailer. The 30 minute ride to elevation leaves you in a massive parking lot near lift lines. A quick check of all gear and we are off. Conditions were crystal clear, and trail conditions were medium to dry. My only previous experience in Ashland was full-rain. However, Ashland's dry soil composition doesn't translate into loose, and the lines of Ashland make for a blaze of flowing trail. The extras were fun, but day 2 held some terrific riding. Out-of town lies a wooded local trail that breaks out of logging fields. At first overgrown and wet, with a slight uphill, the trail turns downward and turns into a 12 minute all-out tree lined blast. So good. 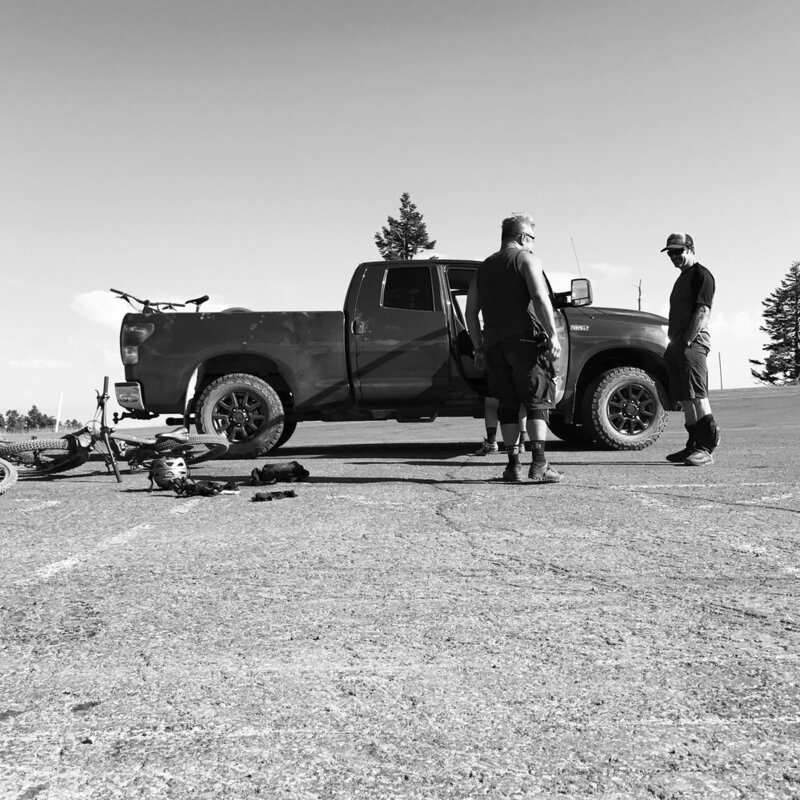 You don't always get to ride the local spots, but Quoc's rapport with Bill makes for some extra-curricular shredding. Bill a veteran pro and is near impossible to follow down what turned out to be steep, fast, duffy, brake cooking descents. Ultra gracious of Bill to get us up there to sample. 2 9-5 days of riding makes for solid work. There is nothing like that feeling of riding your bike all out for 2 days, That kind of works makes one hungry and reluctant to pull a 5 hour drive home, but we made it. Weekend well spent. The Downieville classic is staged in the rising range above the Yuba river which drove the gold mining town. 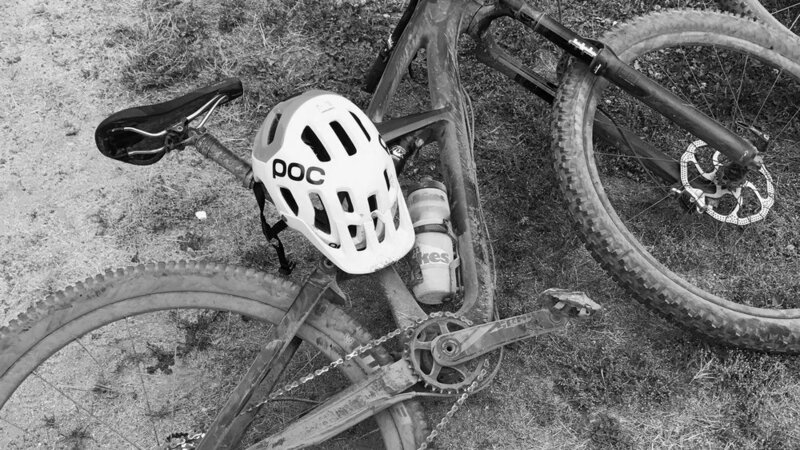 Over the course of the race, terrain varies from pavement, hardpack, loose shale, boulder fields, deep cool creek crossings, loamy wooded sections and finally to ever present powdery dust. By the height of the summer + the additional pummeling by hundreds of riders the course is a giant hazard. Intensive preparation of my bike with a fresh set of tires and pads + the rations and beer needed to sustain me through the weekend is usually a time consuming affair, but recommended as Downieville can bring out the worst in equipment. Here a picture of a fresh - and soon to be trashed - bike enroute. I approach my stay in Downieville on race weekend with a sleeping bag and the expectation of car camping. 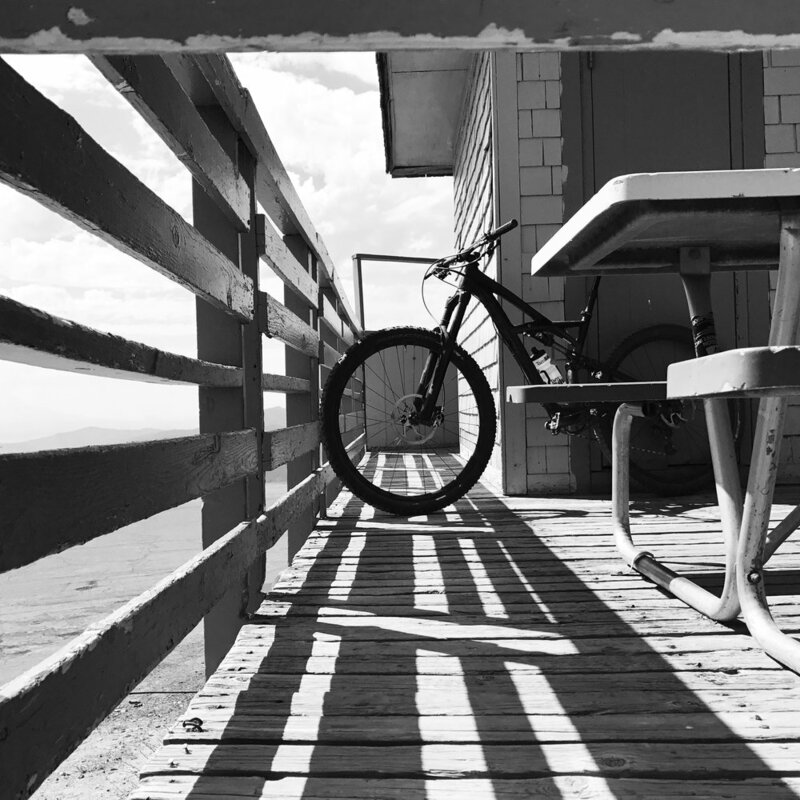 This year I had the happy fortune of staying with the Wilderness Trail bikes crew. 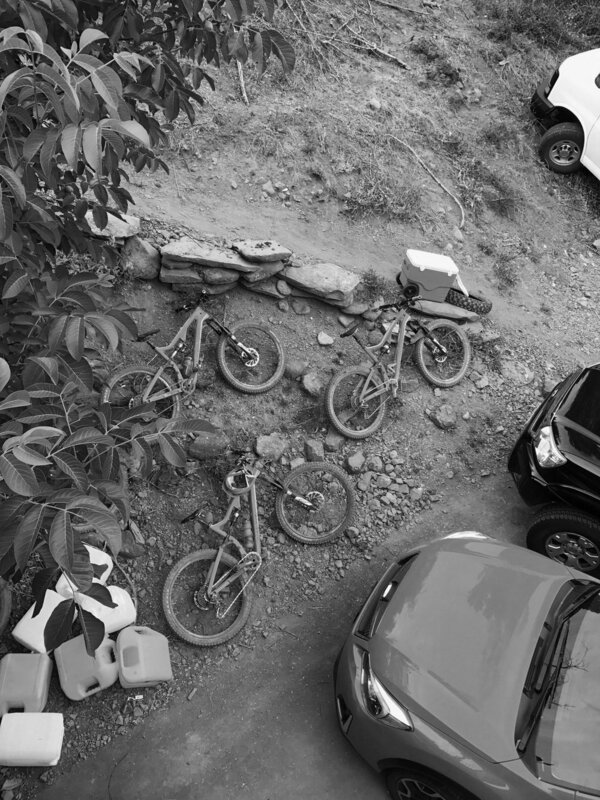 Legends like Mark Weir rolled through, e-bikes were rallied, barbecue was consumed in quantity, Jell-O shots were made, and bears plundered the nearby apple trees. Perfect. From the bay area, Downieville is approximately 4 1/2 hours. Trails are ride-=able from May to November and shuttle services are recommended. Yuba Expeditions is the way to go for transit to elevation and complete shop needs. Downieville was once a hub of gold mining activity and holds the infamous title of the only town in the US to hang a woman. Present day is it a town of 150 with a few sleepy streets, a beautiful stretch of the Yuba river, and friendly and quirky locals who thankfully embrace a 5000 person takeover of the town for a solid 5 days. Race weekend is bustling and often full of amusing debauchery but on any other weekend it is a sleepy, terrific place. Giant shout out to the fine people of Wilderness Trail Bikes, especially Heather McFadden, Bryan Collins, Clayton Wangbichler for fresh flawless tires, tacos, and Jell-o shiots. You guys are rad ad appreciate you having me over at the "Lodge"
I love coffee. Any good day must start with a cup or three of only the finest. And so I choose Cibo of Sausalito for that cup. I've been in attendance from nearly day 1 and know the owner and team by name. This place has revived me for countless mornings and hosted far too many of business meetings. I have to thank them and will shed a tear if there comes a time when I can't have a cup here. All coffee is roasted on site by Carla and everyone on the team can pull a mean shot of espresso. Carla at work in the "greenhouse" roasting and coffee bar - where the magic happens. Beyond the terrific coffee offered, all Cibo food and pastries are made on site or within a few miles at their own bakery using local organic ingredients. The almond croissant is a personal favorite, but the rest of the menu does not disappoint. 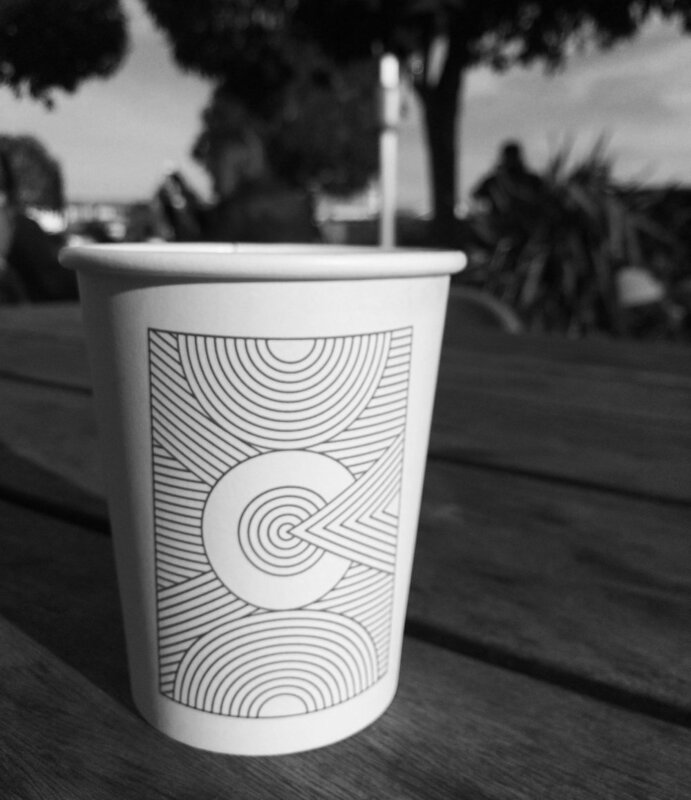 The owner of Cibo has a particular design bent which means everything is meticulously designed and terrifically presented, from the custom cup artwork to the labeling of hand made pastries. Sausalito has architectural character and Cibo benefits from the coupling of an old brick structure and the bones of an old gas station. It's both bright, rough, and charming. Showing up every morning at one spot for nearly 8 years has allowed me to show my artwork and cycling design work here several times, Above, my most recent works hang happily against the brick walls. I've been coming to Rising Sun Auto for nearly 20 years. 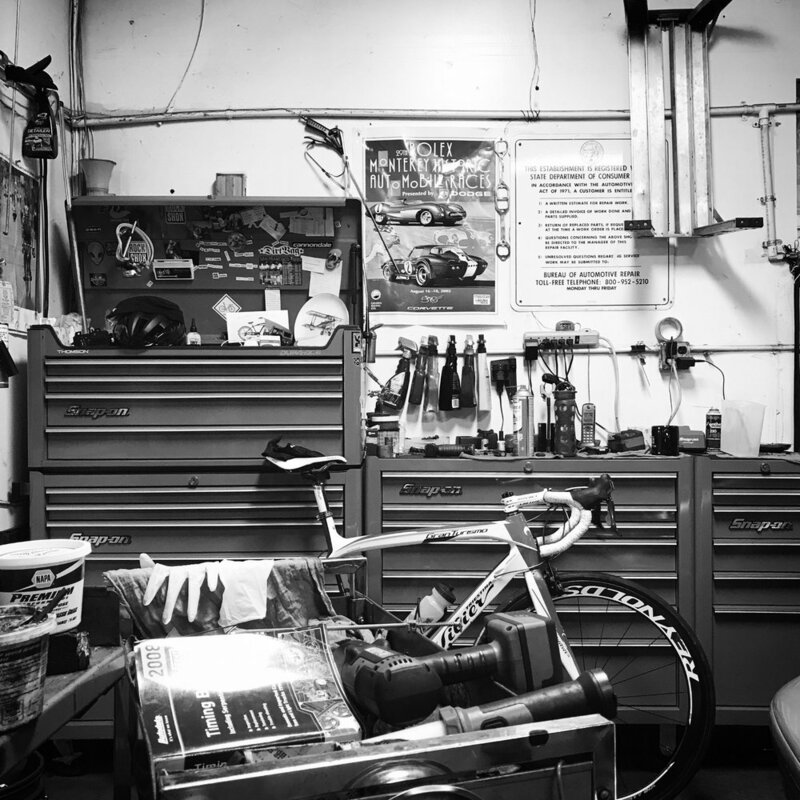 Rising Sun is owned and operated by Sean Cinelli, a damn fine mechanic and one hell of a cyclist who has been on the Marin cycling scene since the beginning - he'll tell you stories of The Cove bicycle shop, BMX racing, and the good 'ol days when Marin was beautiful and blue collar. Sean has done me countless favors, let me wrench on the mechanical disasters that were my first cars, and has provided coffee and good advice the whole time. 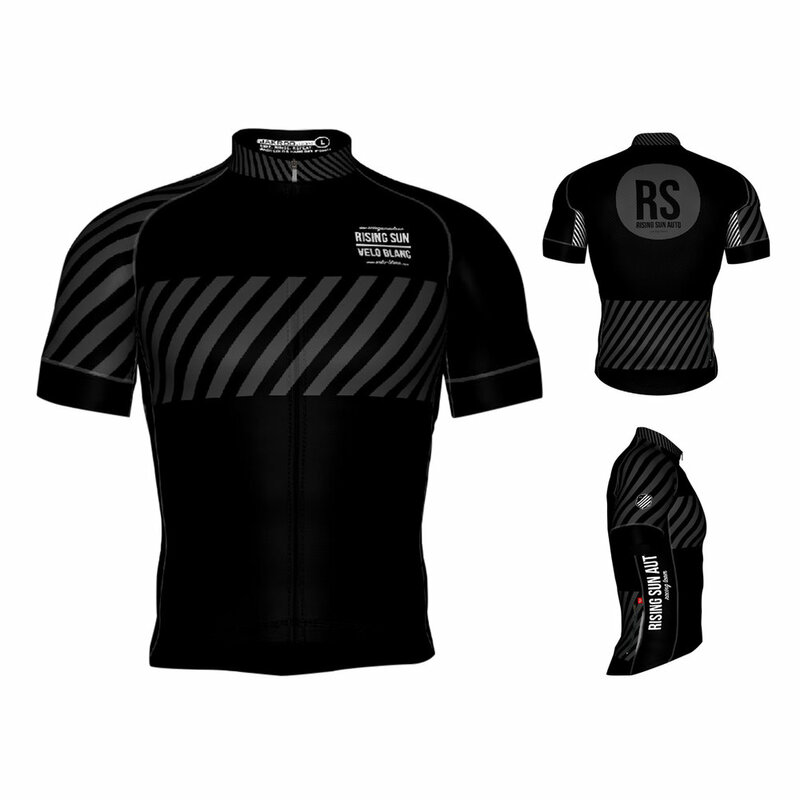 After all these years it only made sense to design a kit for a guy that rad. 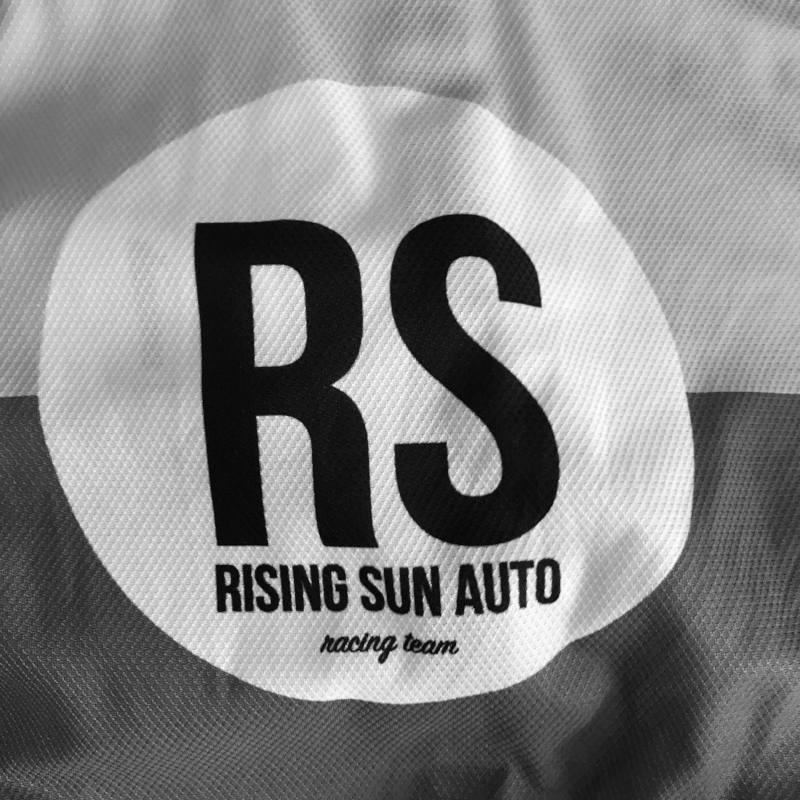 So its come around to a sleek black build, subtle graphics that show both the Velo Blanc stripes and handsomely present the vintage race car inspired Rising Sun logo. They're available in the Shop, ride one with pride! Working to fuse Sean's brand with Velo Blanc style was a fun. The mash-up of auto and cycling culture elements makes for solid material and Sean was a great co-designer + I got my oil changed while I designed! Sleek black and tonal greys made the cut for the final design.